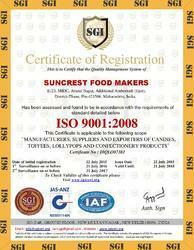 Since our commencement in the year 2009, we, “Suncrest Food Makers”, are an illustrious entity, engrossed in manufacturing and exporting a comprehensive range of Toffees & Candies. Offered products are widely acknowledged across the market for their features like purity, freshness, and quality. Before final shipment at the customers' premises, offered products are checked stringently on various quality parameters by our highly skilled quality controllers to ensure their quality. Owing to this, these products are highly required by our valued patrons across the nation.Further, we have a spacious and modern warehouse facility at our infrastructure unit, which enables us to store these products systematically for a long period of time. We are supported by a team of skilled and experienced professionals, which help us to accomplishing our business process in an effective manner. Our team is appointed through rigorous assessment of their skills, working experience, and knowledge. Well-versed in their respective area, this team manufacture high-quality products. To process the offered products, our professionals make use of finest-grade ingredients that are sourced from the reliable and trusted vendors of the market. All the business related process are carried at our infrastructure, which is divided into many units for the hassle-free manufacturing process. Apart from this, we are offering these products at budget-friendly prices tour valued customers. Under the valuable guidance of our mentor, 'Mr. Manish Visaria' (Partner), we are growing day by day in this domain. Owing to his rich industry experience and deep knowledge of this field has helped us to meet the exact demands of our valuable clients in a best possible manner. Quality has always been a substantial feature for us in order to improve our sales quantity. The offered range of products is processed using the optimum grade ingredients and contemporary technology in accordance with the international quality standards. We have also formed a quality control system that is managed by an experienced team of quality inspectors. Our team of quality controllers examines ingredients that are used in the production process so as to ensure that only flawless range at the clients’ end. We lay immense emphasis on achieving total client satisfaction to maintain our reputation and market credibility. Our offered range is highly appreciated for its freshness, wonderful taste and longer shelf life. These products are available in various tastes and flavors to meet the diverse demands of the clients. As maintaining high quality is our prime concern, we use only tested ingredients in the processing of our offered range. Due to prompt deliveries, ethical business policies and reasonable pricing structures, we are constantly expanding our huge base of satisfied clients in various parts of the country. As a reliable manufacturer, exporter and supplier, we are offering our clients with best quality Toffees & Candies. We have been able to channelized business activities in a hassle free manner only because of our team of well qualified professionals, which holds vast knowledge of this domain. By installing ultra-modern tools and technology in our manufacturing unit, we are able to cater the bulk demands of customers in timely manner. 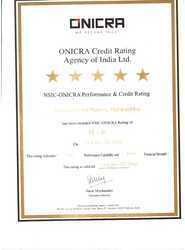 We are certified by Onicra. Backed by a team of hardworking and dedicated professionals, we have been able to manufacture, exporter and supply a quality assure assortment of Toffees & Candies for our customers. Our team of professionals works round the clock to execute the business related tasks in best possible manner. Well-versed in their respective fields, our professionals understand the precise specifications and requirements of our customers. In addition to this, we are providing regular training sessions to brush up their knowledge and skills.